This is the first in a short series of posts on the downsides of city-county consolidation. Actually, it might better be described as a discussion of some of the pros and cons of “big box” vs. “small box” municipal government. It is similar to business. It seems like every large business is either doing one of two things: centralizing or decentralizing. There’s a sort of cycle of reincarnation about this. Every model has its flaws, and people tend to gravitate towards the other side of the spectrum from time to time when the problems of the current mode manifest themselves in a particularly severe form. As a prologue to this, you might want to read my previous examination of city-county consolidation post, if you haven’t already. I haven’t read all the academic literature on city-county consolidations, so won’t make any strong claims about the benefits its promoters have touted. But I will make two observations. One, I’m not aware of any city that has gone through a city-county consolidation that has become a civic failure, or which has a severely under-performing region. Most of the ones I’m familiar with seem to be doing ok or better. Two, if you look at the Midwest region, the metros that are doing well almost all feature a core city that either underwent a consolidation or has managed to maintain its ability to annex new territory. Minneapolis-St. Paul is an exception, but it has regional revenue sharing. (Landlocked and unconsolidated Chicago has a thriving core, but the regional numbers are lagging). So my gut tells me that big box solutions at a minimum don’t hurt and probably have some benefit to a region. But they do come with downsides, and one of them is that it can make neighborhood redevelopment more difficult. The root of the problem is that with a single city covering a large area, there is only one mayor, one city council, etc. These have a large area to concern themselves with and cannot physically devote significant time and attention to each neighborhood. They inevitably spend most of their time dealing with the biggest and most visible challenges, which often means downtown development issues. Indianapolis is a good example of this principle in action. It underwent a city-county consolidation in 1970. Four smaller municipalities were excluded from merger and so are known as “excluded cities”. So we get here both consolidated neighborhoods and some unconsolidated ones we can compare. Since 1970, downtown Indianapolis has experienced a major resurgence. And Indy has emerged as what is in many ways the strongest performing Midwest metro area. I happen to believe its consolidation was instrumental in setting the stage for that. Many of its urban neighborhood have seen challenges, however. This includes many reasonably upscale areas, and I’d like to highlight two of them. 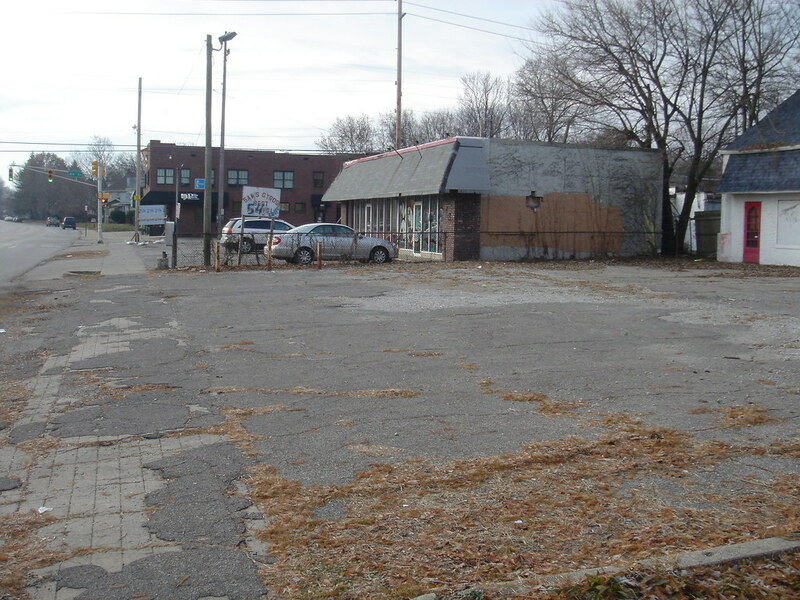 The first is an area centered around 71st and Binford Blvd on the northeast side. It was an established suburban area annexed under consolidation that started experiencing problems recently, notably with decay in its commercial developments, a common concern in aging suburbs. The population was also aging and not being renewed. This prompted a local woman to found a new neighborhood group called Binford Redevelopment and Growth (BRAG) to try to change the situation. BRAG wants more urban, mixed use development anchored by a transit stop on a future rail line, infrastructure upgrades to add basics like sidewalks that are missing in the area, and help redeveloping the commercial districts. They’ve had some successes, notably attracting investment in local strip centers, with a new Starbucks, CVS, and Kroger. But there has been little city investment. The other is Midtown, an area encompassing the historically most desirable urban neighborhoods in the city. It includes the Meridian St. mansion district, Butler University, and Broad Ripple, the city’s main bar district. This area is loaded with gorgeous 1920’s era architecture and many independent shops and restaurants. But this area too started to experience problems, with vacant houses, some struggling commercial nodes, increasing crime, a property tax spike, and deteriorating infrastructure. A group of neighbors here also formed a group called HARMONI designed to change this. They are also promoting neighborhood infrastructure investment, more urban development, etc. As part of this they purchased copies of Suburban Nation and distributed it to all regional elected officials. They even secured pledges of private funding for some infrastructure improvements. However, there has been little city investment in Midtown either. But turn to the excluded cities and see a different pattern. Lawrence, the largest, inherited part of a closed military base. They created a commission to repurpose this into a new town center area. This included a multi-million dollar extension of 56th St, which involved building a bridge over a double-tracked rail line. That project also featured high quality streetscape treatments along its length. Former officers quarters on the base were renovated, and many other townhomes and other residences built. And there has been significant new commercial development as well, such that this area appears as nice and thriving as any edge suburb in the region. As the name suggests, Speedway is the home of the Indianapolis Motor Speedway. It is also an older industrial suburb, with gridiron streets and its own Main St. The town really never leveraged the track outside of race days. The Main St. had businesses but was struggling, and the town was at best stagnant. However, the town council has taken on a major redevelopment program that will involve a major street reconfiguration and significant commercial oriented development designed to turn Speedway into a year round tourist destination and hub of motorsports themed businesses. It’s a $500 million plan, and while not much has happened yet, the town is getting ready to issue bonds to finance millions of dollars in road improvements. A third of the four excluded cities, Beech Grove, is also improving its town center, and has already spent millions rebuilding its main gateway street, Emerson Ave. So three of the four Indianapolis excluded cities have active town center renewal programs, while the two annexed neighborhoods, even though more upscale than the excluded cities in many ways, have seen little tangible city investment. Why is that? The excluded cities have their own city governments. So they have elected officials whose sole focus is their own community. They’ve also got the legal powers, such a the ability to create their own tax increment financing districts, that let them control their own destiny without regards to a higher authority. The annexed areas, by contrast, only have neighborhood groups. These groups have no power to do anything except lobby the main Indianapolis city government. This city government has to cover a huge area and is besieged with many groups wanting things. The mayor has an incredibly limited ability to deal with individual neighborhood issues. For example, he does a monthly “Mayor’s Night Out” in which he visits each township in turn, a different one each month, to answer citizen questions along with his senior staff. But there are nine townships, each one of which would rank among Indiana’s largest cities by itself. And that doesn’t even get to the neighborhood level. The project needs tax assistance to ever get built, but it is looking like it won’t as the project has been on hold for well over a year. If the Uptown were in one of the excluded cities or in an actual suburb, it is almost inconceivable that it wouldn’t get built. The local government would find a way to make it happen. But Indianapolis has higher priorities. For example, a major civic focus is a project on the near East Side in conjunction with hosting the Superbowl. That’s the sort of major event that consumes management time and attention in a large city. This is not to criticize the mayor. In fact, people from both BRAG and HARMONI have told me the city is very willing to engage with them and that the mayor has been supportive. The problem is structural. No mayor could physically deal with the demand. It’s inherent in the very nature of a large, big box government. It seems likely to occur in any consolidated government or very large city without sub-city level authorities with real powers. It was before my time, but reportedly Bill Hudnut, a previous mayor, saw this problem and wanted to create more neighborhood level structures in a system he called Minigov (versus “Unigov”, as the consolidated government is known). But that never happened. Another interesting comparison is the Midtown area of Indianapolis with the suburb of Bexley in Columbus, Ohio. Bexley is more or less exactly the same as Midtown with the exception that it is a separate municipality, though one that is completely surrounded by the city of Columbus. American Dirt ran very interesting profile of Bexley you might want to check out. Photo courtesy Jung Won Kim.Why the difference vs. Midtown Indianapolis? Well, the fact that Bexley gets to have its own city school district while Midtown is part of the stigmatized Indianapolis Public Schools no doubt has something to do with it. This keeps land prices high, which preserves a largely affluent and exclusive resident base. This has pros and cons. Of course it means the city can be kept nicer. But it also denies the experience of that to those who can’t buy in. And the overall regional tax base misses out on one of its most affluent areas. This is the problem of all upscale suburbs. Midtown, Indianapolis, whatever its faults, has many well-off homeowners who pay significant money towards the broader community, including the city schools. And it is a much more mixed income area. Bexley also has its own municipal authority, while Midtown does not, with the implications discussed above. But another thing occurs to me. Because Midtown is part of a much larger city, it suffers from the problem of a diffusion of responsibility. That is, it can assume the rest of the city will carry the load in some respects. This manifests itself in a strong anti-development NIMBY contingent that is opposed to urbanization. Any proposed development of any kind is greeted by wailing and teeth-gnashing by opponents, who’ve been known to do things like pull their kids out of school to serve as props at mid-day zoning hearings where commissioners are told neighborhood kids will literally die if new apartments are approved. I don’t know what the sentiment is in Bexley, but they’ve certainly implemented more actual urbanization than Midtown. I suspect one reason is that Bexley knows it has only its own tax base to rely on. If its residents want to keep quality schools, they can either approve more commercial and intense development, or watch their residential property taxes go up significantly over time. That focuses the mind wonderfully. So I also hypothesize that in addition to making redevelopment more difficult for reasons of the structure of government, big box government also inculcates an anti-development mindset to a greater degree than small box government. So how do you deal with this? Chicago is a big box government that has solved the governance problem with a ward system. There are 50 city council members, who more or less are the gods of their ward as a result of a system called aldermanic privilege. This is where the alderman basically agree they will let each other do whatever they want as long as it is in their own ward. Various city agencies also more or less defer to the alderman on almost any decision to do anything. This results in a system where the mayor deals with the big issues of the city and major developments, while the aldermen deal with neighborhood issues. The Chicago system has maintained many strong neighborhoods in the city, but it has its downsides. Aldermen have virtually unlimited authority in their wards, making it a sort of elected dictatorship. So it should come as no surprise that corruption has been rampant. In excess of 40 alderman have gone to jail for corruption in the last three decades, an astonishing rate. This also makes things like planning difficult, and creates a climate of great political uncertainty around development. The Chicago system is a de facto one, not based on a city charter or anything like that. It would be interesting to see how it developed. But it does show that you don’t necessarily need constitutional change to effect small box government inside of a big one. The historical changes relevant in this case are not only an immense increase in the size of great cities, but also the immensely increased responsibilities….which have been taken on by the governments of great municipalities. New York is not unique in failing to match such profound changes in circumstances with appropriate functional changes in administrative and planning structure. I can’t do this chapter justice here, but it is a must read. Her basic solution is that all city agencies – police, fire, planning, parks, etc) would be organized around districts (neighborhood groupings), with contiguous borders, with service delivery coordinated between them and with the input of the neighborhood. Chicago’s ward system is similar to this, with the notable exception of having a district dictator. That might be a cautionary tale about what this sort of thing can turn into. To me this implies that cities which retain a relatively small and governable core along with a plethora of unconsolidated suburbs might be in an advantageous position from a redevelopment perspective. Cincinnati, St. Louis, and Pittsburgh come to mind. Their many separate towns in the core county have the independent power they need to take matters into their own hands if they so desire. And the core city itself should be small enough to enable more fine grained governance from city hall. On the downside, it seems almost inevitable that many of these unconsolidated suburbs will turn into complete failed cities, often left ignored and forgotten. There are plenty of beyond dysfunctional suburbs in Chicago just like this. I presume it is similar in places like Pittsburgh. I think it is notable that consolidated cities like Indianapolis and Nashville don’t have any truly failed suburbs. Another benefit of the big box city. I think the lesson here is that there are always, always trade offs to be made in governance. The trick is to understand the trade-offs you are making and take steps to try to mitigate the inherent problems with the model your city and region operate in. Based on this and the previous post, we might say at high level that for big box government, the pros are stronger civic consensus and cohesion, generally stronger regional and downtown growth, a fairer tax base, and a general lack of totally failed central cities and suburbs. The cons are a weaker city neighborhoods, redevelopment challenges outside of downtown, weaker urban identity, and lower quality development. For small box government is is basically the inverse of this. The pros are a strong central city & urban identity, higher quality development, more redevelopment opportunities. The downsides are civic fragmentation and lack of consensus, the potential for a failed central city, some failed suburbs, and possibly weaker downtown growth. Being the child of a longtime Bexley family who later grew up to live almost 25 years in the HARMONI area, I find most of your analysis (as the Brits would say) spot on. I have a pretty lively disagreement with the concept that the HARMONI area is a “midtown” district. It’s an “uptown” district, insofar as the typical house there sells for upwards of 2x the area median price. “Midtown” Indianapolis is south of 38th Street, because it is the transition from the almost exclusively residential uptown area to the mainly commercial downtown district south of 16th Street. Bexley’s densified area (as illustrated in the photo) was already very commercial. Main St. through that part of Bexley was US40 and I can’t remember ever seeing more than one or two houses on it in the past 40-45 years. That section is much more like Washington St. in Irvington. It was not a “noded” artery like College Avenue in MK; what wasn’t commercial was institutional: Capital University, Christ Lutheran Church, and Main-Montrose School are three of the big ones. Your post calls for a re-evaluation of idea city (or neighborhood) size. Not a topic discussed much these days, but worthy of renewed dialogue. I recall that Plato and other like Ebenezer Howard thought units of approximately 30,000-50,000 were about right. Global economics seems to demand more flexibility and ability to maneuver in order to address changing marketplace conditions. The same might also be true for communities changing demographics brought about by migration. Chicago and its suburbs have a wide range of overlapping but non-aligning jurisdictions (wards, community areas, congressional, police districts, school districts, congressional districts, park districts, planning areas, parishes… you name it). I’ve often wondered how this lack of alignment affects overall quality of life and economic competitiveness. I seriously considered mapping and analyzing a series of jurisdictional overlays in Chicago as a masters project when I was at UIC. There may be one floating around out there, but I haven’t seen it. I think some of the advantages and disadvantages you talk about are really just about a point in time. Indianapolis isn’t really a large or old city, and Unigov hasn’t been around for that long. So it looks like it’s just a bunch of separate cities put together. In time, cohesive city growth will change that. For a growing city, consolidated government can quickly turn into a common identity – see e.g. New York, Philadelphia, and San Francisco. NY, SF, and Philly all have neighborhoods with distinct identities as well as some unassimilated suburban areas, within a larger urban framework. They had even more unassimilated suburbs right after their consolidations, but those have been thoroughly urbanized. Nowadays, they have a mixture of neighborhoods that never declined, neighborhoods that have declined and revitalized, and struggling regions. Where I think you’re right is that in New York and San Francisco, which are the two successful cities here, the declining regions are mostly the unassimilated ones: Canarsie and the North Bronx in New York (New York’s ghettos are moving outward, so the North Bronx is declining, the South Bronx is poor but stable, and Harlem is revitalizing), and southeastern San Francisco. And in both cities, the worst off areas in terms of crime and school quality are the inner suburbs of Newark and Oakland. So what consolidation might be doing is making outer city neighborhoods more like the central areas, while making the areas just outside city limits less like the central areas. This should be true at any level: I believe the same trend is observed in Boston, which is only partially consolidated. If the city is rich, then city neighborhoods will gentrify from the center outward while the inner suburbs will have white flight. If the city is poor, it will have the opposite effect, as in Detroit. In Indy and Nashville, you see different issues because they don’t have the same city/suburb dynamic as the Rust Belt. I would that add that race is a significant factor in shaping the relationships in many of these cities. Cincinnati and Philly (cities I know best), over-developed a sense of the importance of city boundaries that was profoundly connected to race. However, both cities also had histories of protecting certain neighborhoods from blight that helped the suburban/city neighborhoods hang on since the urban crisis (the NW in Philly and much of Cincy’s East Side – Pleasant Ridge and east basically). Columbus on the other hand was plenty segregated but basically annexed itself into being an integrated city, but the spreading blight is doing serious damage from Bexley north to Westerville. Cbus of course is an odd mix of Indy with the more traditional Ohio model in that it has continued to annex but did not consolidate and thus has many significant areas in other municipalities within the core county. I’d also add that Cincinnati developed a very strong township government within the core county, whereas the townships in Columbus are weak and mostly shrinking at this point. Another factor is the degree of “home rule” permitted to first class cities and combined city-county governments under each state’s constitution and laws. Indiana has relatively weak home-rule laws, and only one first class city which has many special state laws that apply only to its governance and structure. In some circumstances, that makes the Indiana legislature our “super city council”, sort of like the situation that exists in DC. Not good. Alon, when you write of “unassimilated suburbs” within Philadelphia, are you referring to the first-ring suburban areas of Kingsessing, Wynnewood, and far-northeast Philadelphia proper, or to the old first-ring suburbs like Drexel Hill, Upper Darby, Conshohocken, Cheltenham, Palmyra, Pennsauken, and Camden? David, Indianapolis managed to both erase and keep those racial boundaries by (as Aaron pointed out) keeping the Marion County suburban township government and school systems in place. Only in the past decade have the county sheriff’s police been merged with the city police, the township assessors eliminated, and half the township fire departments consolidated into IFD. There is no movement or likelihood that the schools will ever be merged, although from 1980-2000 a desegregation order bused African-American city kids to suburban school districts that were “too white”; it was a de facto consolidation of sorts. Today, most people don’t know the “old city” boundaries and it’s hard to find a map that has them. Anyway, the trend continued westward to the Austin neighborhood, the far-western neighborhood at the city limits. Austin Bvd. also happened to be the dividing line between the Austin neighborhood and Oak Park, the first, free-standing suburb. Oak Park, with its independent government, successfully developed a meaningful integration policy, which not only prevented what many viewed as an unstoppable trend, but built the foundation for a fully integrated suburb almost 50 years later. Now, Oak Park is an older suburb, built at the same time as Austin. Same street grid, with most east-west streets bearing the same names as in Chicago. A good chunk of Oak Park’s housing stock is not that different than Austin’s — a lot of brown-brick lot-line-to-lot-line 3-5-story apt buildings, mixed with a lot of older turn-of-the-[last]-century housing. You could drive past Austin Bvd and have no idea you’d left Chicago if you missed the “Welcome to Oak Park” signs. (True, the north side of OP is more affluent with a higher-end housing stock, but the character of the Oak Park neighborhoods that bordered Austin was almost indistinguishable.) The socio-economic make-up of OP and Austin weren’t that different in the 60s (OP was somewhat WASP-ier, but the overlapping parochial school systems and Catholic parish-based structures in Austin and east OP resulted in a lot of inter-marrying and family and friendship ties between the two communities). You can attribute OP’s success to many factors: an enlightened leadership, a somewhat liberal constituency (esp. after so many of the bigots and fear-mongers had moved to whiter pastures in the western suburbs), etc. And, of course, OP had the benefit of watching so many experiments at integration fail, and had some advance warning, since it didn’t face serious block-busting problems until the early mid-70s. But it seems incontestable to me that OP’s success was mainly due to its being autonomous. This not only simplified its politics. It focused its leadership. It allowed for nimble changes that made it flexible. It enabled the citizenry to frame the issues in bite-sized, understandable concepts and examples. It made everyone feel empowered. It was “Village Hall,” not “City Hall.” It enabled local building owners, merchants and neighbors to band together in organizations that were focused on their own turf. It allowed for much better coordination of property tax dollars and CDBG and other federal grant money. The school district is roughly coterminous with the Village, so data could be shared, and a single message delivered. There was also an enormous amount of pride-of-place, as Oak Park took on national renown for its approach. Oak Park is probably more the exception than the rule in the Chicago metro area. For every Oak Park, with its enlightened housing policies, there were probably two Ciceros in the 60s-70s, whose governments crystalized the worst in racial discrimination practice and policy (or two Oak Brooks, who did it with more finesse, through large-lot zoning and not permitting multi-family housing). Looking back, now, over the longer haul, if you look at the entire Chicago entire metro area and systematically study housing patterns and policies that encourage or discourage segregation, it’s probably the case that Chicago has done a better job than its suburbs in accommodating integration. And that may well be due to the amount of territory its policies and ordinances cover. Not sure what any of this illustrates, let alone proves. Maybe this: The rule should be, if you’re a progressive “good government” type of place (in other words, you are somewhere where readers of this blog would like to live), you should be able to govern yourself (except where you don’t want to because it’s a pain in the neck or too expensive); and your neighboring communities should only be allowed to govern themselves to the extent that their policies don’t hurt us. And we should have an equitable system for collecting and allocating tax dollars across jurisdictional lines — as long as we get a little more than our fair share. I agree that some sort of autonomy, whether formal (incorporated suburbs) or informal (wards, districts or some similar structure in a larger city), is the best way to get effective neighborhood redevelopment. But there are caveats. I’m familiar with Chicago’s ward system, having worked in it. Yes, aldermen do have nearly complete control of their wards, and it does lend itself to corruption. Honestly, an even greater fault than corruption (to me) is poor ward leadership. Wards that have aldermen with knowledge, capacity and leadership ability have done very well over the last twenty years or so; many wards have elected aldermen without that ability, and the wards continue to languish. A lot is put on the aldermen to turn their wards around, and not all are capable of doing it. I also think a lack of neighborhood autonomy is one of the many things that afflicts Detroit. Detroit has MUCH weaker neighborhood identification than Chicago, and no ward system that provides some representation. In fact, Detroit lost its ward system in the early 1900s when it dealt with political corruption at that time. Today, Detroit’s City Council is comprised of nine at-large persons coming from anywhere, and there are large swaths of the city that just haven’t gotten the attention they deserve, or any representation of any sort for decades. Maybe Detroit’s reorganization from 100+ years ago has more in common with consolidation than I realized. Why doesn’t the developer of the “Uptown” partner with Simon Property for the retail portion of the development? Therefore, he could perhaps get the needed cash infusion to get the project off the ground. Is that too radical of an idea? Jane Jacobs’s recommended solution was actually largely implemented in the 1975 amendments to the NYC Charter, which required coterminality of service delivery with the boundaries of a series of defined community boards. See Section 69 of http://www.nyc.gov/html/charter/downloads/pdf/citycharter2004.pdf . The city has spent the last three decades progressively implementing coterminality across old and well established (not to say resistant) line agencies, but its overall effects have been weak, in my opinion. For one thing, the power of a given CB is highly dependent on whether the centralized Department of City Planning/City Planning Commission work with or in opposition to it, and there are examples of both experiences. CB 9 in West Harlem, with which I’ve had recent interaction, has published a nice overview at: http://cb9m.blogspot.com/2006/03/community-boards.html and that was before the worst of their recent clash with DCP over Manhattanville ( http://tbed.org/?p=347 ) . The community boards are somewhat larger than the traditional neighborhood boundaries, and soak up a lot of the voluntary energy that might otherwise go to community associations. All in all, coterminality has been a positive, but it does not substitute for the kind of autonomy that you describe in this essay. But all hail Jane Jacobs, any way! David, the overview on the CB 9 website explains precisely why the process in New York isn’t working so well – the city doesn’t really have to listen. 197a plans are only advisory, and almost never get approved over developer-oriented 197c plans. In addition, schools and policing are done in different districts, which are either much smaller than CBs (precincts) or much larger (school zones, groups of precincts). This takes the most important political issues out of CBs’ hands. I think another problem is that the CBs are appointed rather than elected. And drop the personality contests – force people to contest those elections on unified lists. Non-ideological politics is the easiest thing in the world to corrupt with money; that’s partly why billionaire-politicians downplay ideology in favor of managerial issues. 1. I like Jane Jacob’s idea. I think long-run it’s probably one of the best structures. I wonder if the Twin Cities’ revenue-sharing system isn’t almost a mirror opposite of that system, with communities interconnected financially but governed individually. 2. Bexley’s status as its own community with its own school district has a lot to do with its success. It’s also a very monied area, being home to the Governor’s mansion, among other large mansions. There was quite a bit of controversy a few years ago when they started redeveloping their main street with 4+story buildings, but their tax base is limited, so that won out. 3. Columbus has definitely suffered over the years from a lack of focus on individual neighborhoods. That has changed quite a bit recently, but even in nicer areas you notice a uniformity that comes from all the areas being developed under one master set of standards. The City traditionally focused on the tax base, for obvious reasons, more than the character of its neighborhoods, which means annexing more commercial areas. I sense that Indy has some of the same issues. On the east coast the opposite is true. They tend to focus on preserving the character of a community. Ironically, that may be due to tax systems. I read a study once that analyzed three tax systems for municipalities: sales tax, income tax and property tax. It showed pretty clearly that cities enact strategies that maximize their tax revenue. So compare a New England city to Columbus. New England cities are funded almost exclusively by property tax. The motivation is to preserve property values. In Columbus, the main municipal tax is income tax, WHERE YOU WORK (an important distinction). So looking at these two models, on what should you focus? Well, look at most highway exits in New England. With the exception of a few major routes (like U.S. 1) or urban downtowns, exits empty off to an area that might have a gas station or a convenience store, but then quickly go to residential areas. Oftentimes you are in a major suburban area but don’t know it until you drive down the road and see all the homes. In Columbus almost every highway exit has substantial commercial development, with strip malls and warehouses dotting the landscape. As a resident, which is prettier and more desirable? Probably the sleepy-looking New England exit. Certainly New England has a leg up on Ohio in the scenic arena. But if you live the next exit up and it has a large strip center and some warehouses, well that’s not as attractive. Maybe folks don’t like your exit as much. I think there’s a sense (rightly or wrongly) that the atmosphere of an area drives property values. And you want to preserve those values, because that’s where your money is. In Columbus, or any Ohio city, what really matters is having those commercial facilities IN your city, because that gets the income tax. So you are going to compete to get these facilities, even if it means that you put that warehouse right next to a neighborhood which drives down its property values. It also drives spending. In New England, you are likely to spend money investing in classy infrastructure like sidewalks and new roads in existing areas. In Ohio, the incentive is to capture new growth in commercial areas, so you will focus on expansion, sometimes to the detriment of more established areas. How does this tie to consolidation? Well, one of Columbus’ main goals in its annexation policies was to capture land around every highway exit on the Outerbelt. They more or less succeeded. Their whole policy of consolidation over the past 50 years was driven by their desire for income tax. I wager that if you imposed a New England, property-based tax system in Ohio, you would see a significant shift in development patterns. To be fair, New Englanders are more likely to disdain smaller houses in their cities (lower property values), while Ohio cities are often more welcoming of them (market demand for commercial developments). So there are positives and negatives to both systems, but looking at the underlying structures is very important in understanding how a policy will impact a community. George, that’s an interesting take on city strategy. But I’ll add a kink to what you say, which is that some of the most aggressive cities on pedestrian amenities are income and sales tax-funded, for example New York City and San Francisco, and in general most other big coastal cities. You could explain their love for pedestrianism by saying that it’s their way of attracting yuppies, who make a lot of money and thus pay high income and sales taxes, as well as tourists, who spend money in the city and again pay sales taxes. But the same might be true for Columbus – the more attractive it is for upscale shopping, the more tax revenue it will have. Conversely, the suburbs of the coastal cities tend to be hostile to pedestrianism. They protect property tax revenues in other ways, for examples restricting land supply to raise land prices, and maintaining exclusive upper middle class reputations. But they are usually not too keen on things that interfere with the ability of residents to drive everywhere without worrying about pedestrians. George, some of it has to do with “economic geography”. One aspect is parcelization. New England has been settled for nearly 400 years, and there are few large tracts left unbroken. There is also a one-sided development pattern: the old New England cities grew up on harbors, and often those harbors were where rivers flowed to the sea. Columbus and Indianapolis are on plains, with only minor rivers and hills. There is no shortage of large farms at the edge of development in the Midwest, wherever the edge of development happens to be in any given year. Working farms in the Midwest were aggregated, not parcelized, over the past 50 years. So there are huge tracts in every direction, a marked contrast to New England. And Columbus and Indianapolis both brag of being within a day’s drive of 50% or more of North America’s population. No wonder that both cities have those outlying industrial parks and warehouse districts at their outer belts. But Indianapolis collects sales tax only to fund its stadium debt, and only within the past 5 years has raised its (resident-only) income tax to about 1.6% in response to state caps on property tax rates. That is to say, Indianapolis was property-tax dependent, and it didn’t have to annex helter-skelter to control its outer-belt interchanges because Unigov took care of that in 1972. We no longer have any way to capture tax revenue from commuters, as the ability to tax their offices and factories is diminished by property tax caps. Indianapolis cannot annex beyond its home county, so the next step is either an overhaul of the “tax mix” or some form of metro county cost and revenue sharing. I suppose it’s necessary to answer the question of whether home-county consolidation “works” before we start talking about metro (multiple) county consolidations, and certainly the permitted tax regimes (usually controlled at the state capitol) have a major bearing on the answer.